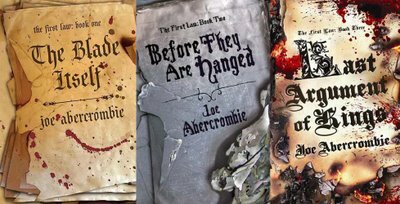 Today I've finished reading Joe Abercrombie's trilogy and thought I'd write a few words about it. I first learnt about it in an article I read somewhere that recommended it as an alternative to "Game of Thrones". There are some similarities; chapters show events taking place in different places and show actions of certain heroes (but unlike in Martin's works they are not presented from different characters' perspectives), motifs of war and invasion of hostile nation, dirty politics, etc. Howerer, Abercrombie's books read differently. The book uses themes that can easily be associated with any fantasy book. There's an ancient wizard whose goals are mysterious, a veteran warrior whose past is filled with violent exploits, a dandy who irritates everyone but changes over time, a mysterious female warrior, etc. What I really liked was how these were presented in the story. Abercrombie uses these themes, adding unexpected twists and using a very practical, often even ironic approach. The character that stood out the most to me was Glokta. A kind of anti-hero. A former fencing champion and an accomplished oficer, now a ruin of a man after two years of imprisonment and torture. He is an inquisitor and while doing his job dutifully, he often asks himself a question "Why do I do this?". Chapters that focused on him were my favorites, especially the dialogues. They were really nicely constructed as we could follow both the exchanges between Glokta and his interlocutors and read his thoughts interwoven between these, more than often showing that what he says and does is something completely different than what he thinks. Once again, it's hard to avoid comparing him with Tyrion Lannister from "Game of Thrones" (my favorite character in that series). I really enjoyed reading these three, probably my first dive into fantasy since I've finished Martin's works. Abercrombie's narrative flows nicely as he describes events both small and great. The protagonists are not necessarily likable but they are quite complex, which makes them even more interesting. Overall, a very good series, I can highly recommend it to everyone who is anxiously waiting for The Winds of Winter and it gets a 4+/6 from me.